Whenever there is talk of a cure for food allergies, hopes soar. One area of research that has had consistently promising studies in the last few years has been the Food Allergy Herbal Formula, currently called B-FAHF-2, which is being developed by Dr. Xiu-Min Li at the Icahn School of Medicine at Mount Sinai in New York. What we often don’t hear about, however, is the people who toil in the labs, making this research possible. 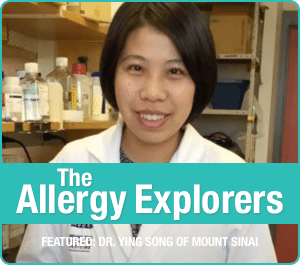 One such person is Dr. Ying Song, a professor of pediatrics at Mount Sinai, an expert in mice and allergy research and a key player on the herbal formula research team. 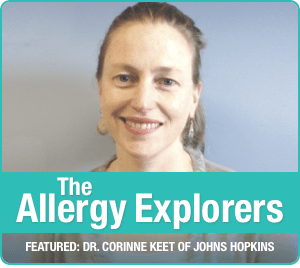 As we launch our new Allergy Explorers series, which celebrates those working tirelessly to find treatments for food allergies, Claire Gagné talks with Dr. Ying Song about her role in this research, what she’s learned about Chinese herbs, and her findings on the impact of mother’s allergy status. How did you become involved with Dr. Xiu Min-Li’s research? Back in China I did my post graduate fellowship in immunology, but at that time I was interested in cancer immunology. I found a lot of papers in PubMed, the database of medical research literature, from Dr. Xiu-Min Li’s group at Mount Sinai Hospital in New York. They were working on herbal medicine in the immunology field, which grabbed my attention. I e-mailed her wanting to talk about it and she said, “Why don’t you join us to do immunology research here?” I came to North America eight years ago. What has your role been in the herbal medicine research? The Chinese herbal formula (FAHF-2) for food allergies has been studied for more than 10 years at Mount Sinai by our group, but there are still a lot of questions we need to answer. For example, how the complex interactions produce synergistic effects, and how to reduce the large numbers of pills it requires taking a day. A big part of my job is to understand how the traditional Chinese medicine formula (FAHF-2) prevents allergic reaction. 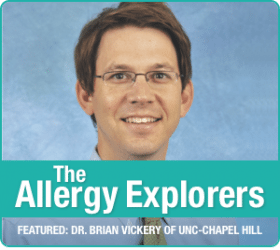 My major finding was to identify three pure compounds that promise to benefit millions of allergy patients as anti-allergy therapeutics or as add-ons to other immunotherapy regimens. We sensitize normal mice with peanut and then test different combination of herbs or active compounds isolated from the herbs on our mouse model to see short-term and also long-term effects – are they safe, can they reduce IgE antibodies, can they help to reduce anaphylactic reactions when we give the mice a huge amount of peanut? If we see a good trend or possible effect, then we will also work on figuring out why. We’re also testing the Chinese herbal formula in combination with other treatments, such as oral immunotherapy. What have you found out about why the herbs work? We found that some compounds in herb extracts reduce IgE levels, some reduce inflammation, and some block mast cell and basophil histamine release. The bioactive compounds in FAHF-2, which contains extracts of several herbs, have all these effects. We have learned that these effects are associated with changes in the immune system that represent a more normal (or non-allergic) status. We are now finding alterations in the molecular biology of immune system cells. How receptive to Chinese herbal medicine do you find people in North America are? It may not be mainstream here, but people are increasingly interested in and receptive to Chinese herbal medicine. I expect that as research demonstrates the effectiveness of certain herb extracts, and eventually pure herb compounds, that it will become more mainstream.